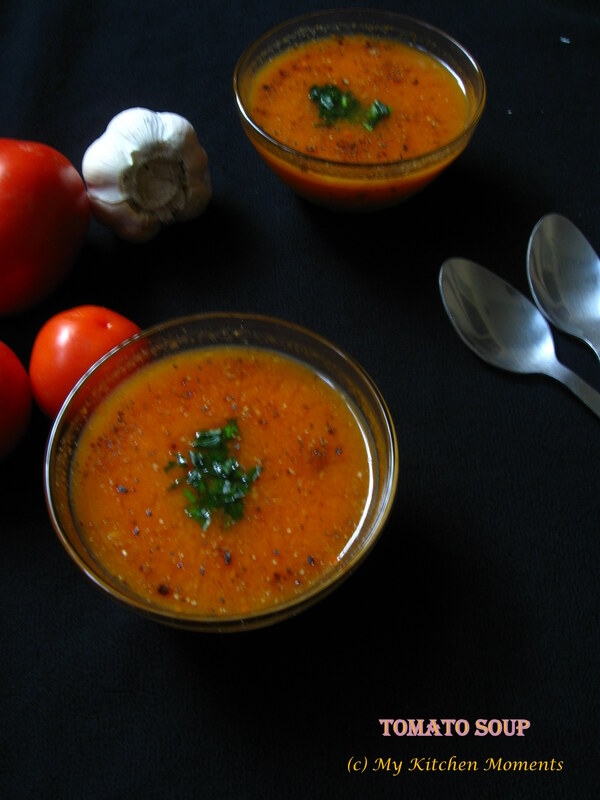 Tomato Soup is one easy to prepare, simple and humble soup. 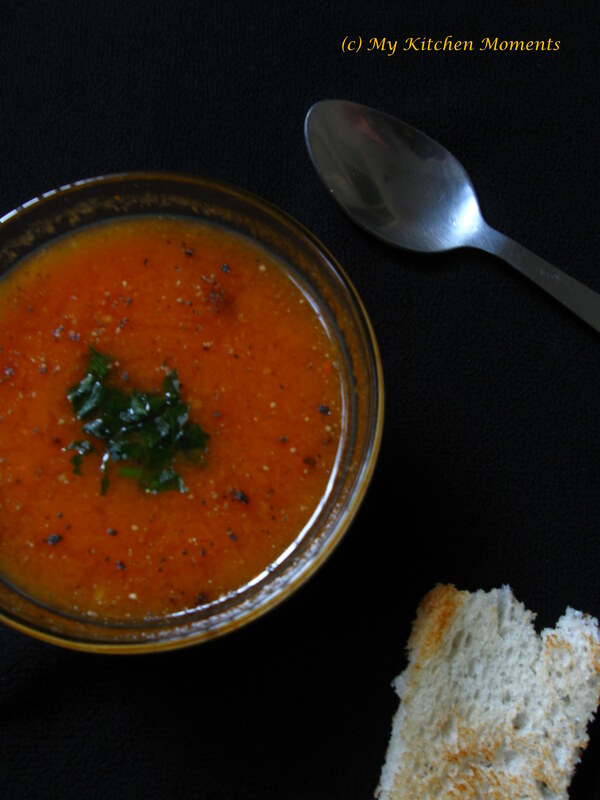 Daddy dearest always calls it to be the cousin of the South Indian Tomato Rasam. And when we as a family go out for dinner, we end up going straight to having the main course and not the starter/ soup. Nobody at home prefers to have soups often, so mom rarely makes it. On the other hand, dad, my sister and I prefer to slurp the soups once in a while, but mom has an aversion towards soups. Just for the sake of eating the croutons dipped in the soups or just by saying that soups are good for health much to the annoyance of my mom, once in a while soups find a place in the dining table at home. Anyway, coming back to today’s recipe – The Simple Tomato Soup. 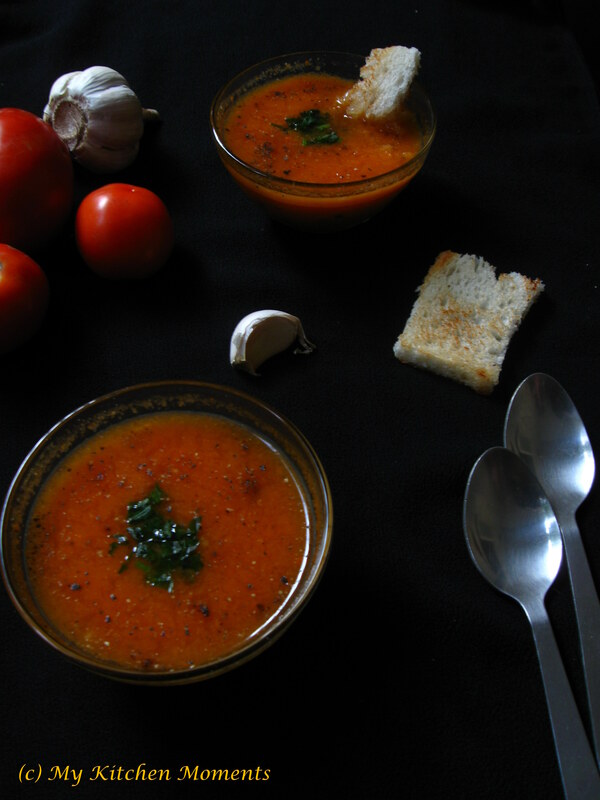 There are few points to be kept in mind to make a really good tomato soup. First and foremost, use fresh, ripe, red tomatoes and completely avoid using tomatoes which are unripe, slightly yellowish shaded tomatoes which has the potential of being sour. Always blanch the tomatoes first, and then puree it. You can skip the usage of onions in the soup. And most importantly, there has to be a slightly sweet tanginess in the soup rendered by the tomatoes and this has to be finely balanced with the good use of pepper, salt, sugar and corn flour. You can serve the tomato soup in a number of ways. Firstly, the tomatoes can be pureed completely without any chunks in the soup or if you prefer, you could also prepare with chunks of tomatoes and finely sliced onions in the soup. You can also use cream or corn flour or fresh corn kernel blended with tomatoes to make the tomato soup. It’s all up to the individuals choice as to how one wants to have the soup. Heat butter in a deep heavy bottomed pan (you can also use a pressure cooker), add the roughly chopped garlic, onion, bay leaf and sauté for a minute. Then add water, tomatoes and allow it to boil. (If using a pressure cooker, you can cook for one whistle). Once done, switch off the stove. Allow it to cool completely and blend it into a puree. You can remove skin of the tomatoes before pureeing if you like, but I like the seed, skin and everything else in the soup. Now start heating the soup by placing in a sauce pan, and add the salt, sugar and a pinch of pepper powder. Bring it to boil for 10 minutes and add the corn flour mixed with 1 tbsp water and mix well, so that no lumps form. Add water to bring the soup to the desired consistency and continue to simmer for another 5 minutes. Once done, remove from heat. Season generously with pepper powder. Serve hot with a spring of freshly chopped coriander leaves. And serve with bread croutons. You can use cream if you want the soup to be more thicker and creamier. You can add a slice of beetroot for that extra red color. You can even use coconut oil or olive oil for that healthier touch. Season generously with pepper powder for that added spicy hint. Very heart warming soup 👍😃I would love mine with croutons in it . A bowl of pure comfort! Looks delicious!! An amazing soup to ward off Winter blues during these months! Thank you Padma! DO keep visiting. I am hopping onto your space right now to explore….. Yes, tomato soup is one very easy to make soup. Thank you. This soup looks absolutely comforting and YUM! Looks delicious.. especially with that bread sticks. Thanks a lot Srividhya 🙂 Means a lot! This is what i realy need today! Simple and delicious! Soups make us feel warm!